After watching the horsemanship display, we carried on looking round the Folk Village. 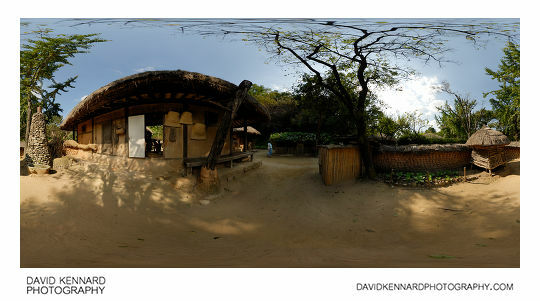 This next photo is of the Seonangdang (서낭당), which is the village shrine. 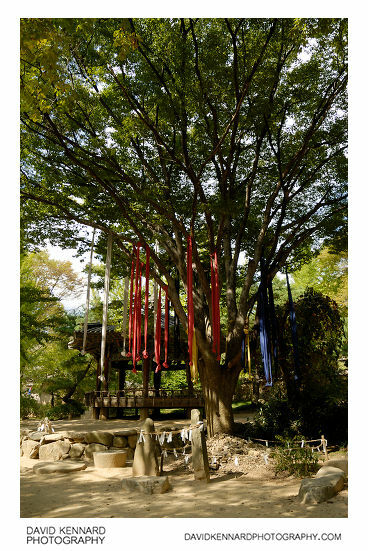 It consists of a tree with long strips of coloured cloth hanging from the branches, some upright stones, and a small building. Villagers would come here to pray for a good harvest and good health. Unfortunately I don't have an English translation of the poem as Google Translate isn't very good at translating Korean. 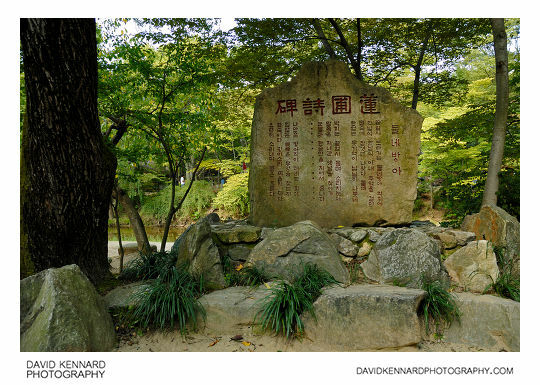 According to a nearby information board, the poem was written by Korean poet Yi Ha-yoon. 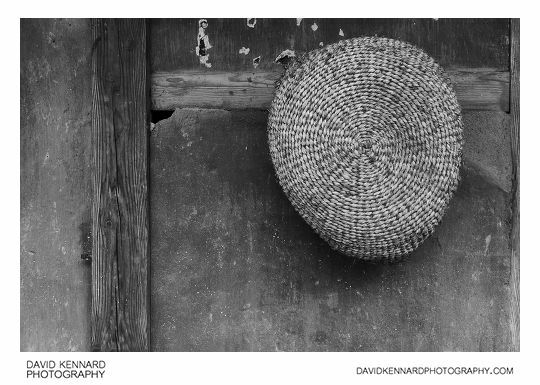 Most of the farmer's or commoner's houses in the Korean Folk Village have baskets and various other tools hanging on the outside walls. Hidden away atop a hill in a wooded area in the north-eastern area of the Korean Folk Village, there was a small area with a buddha statue. 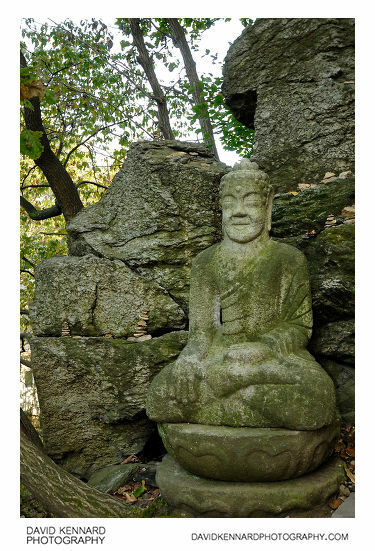 There were also small stone piles placed around the statue, a common sight in buddhist countries. I'm not sure what the exact relevance of the stone piles is, but apparently they are based on the stupa style of buddhist architecture. 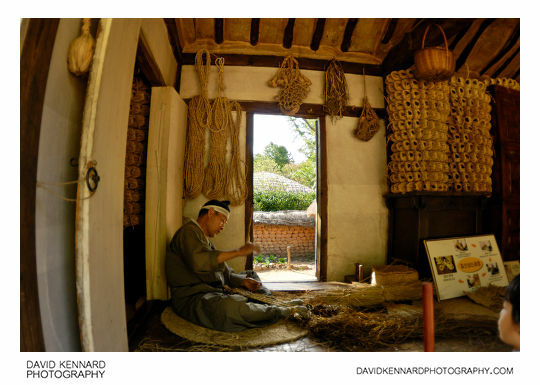 We carried on looking round the folk village, and next went to look round the building Nae Ja-Won. Numberless souvenirs flutter and wave. And offers to me tears and grief. An old miller, whose hair is white. What does his weak eye seek for? It sounds with voice and water flows. And the poet’s bio can be seen here, although the google-translated page is difficult to understand. I am a Korean . I have been writting poem,some Korean word and some English too.I am looking for Editor And Translator to help me. Where I can fine people to help me ? Language exchange websites let you post text / questions, and people who know the language you want to write in e.g. English will offer you suggestions and corrections for your text. Usually, in return, you would be expected to do the same for people wanting to learn your language e.g. Korean.